Đề thi Tiếng Anh B1 của các trường dành cho học viên cao học và nghiên cứu sinh nhìn chung là giống nhau. Trong bài viết này, Tiếng Anh B1 sẽ cung cấp cho bạn một đề thi tiếng Anh B1 có đáp án và đống thời so sánh cấu trúc đề thi tiếng Anh B1 của một số đơn vị được Bộ GD&ĐT cấp phép. TiengAnhB1 cũng cập nhật nhiều đề thi tiếng Anh B1 có đáp án trên trang web. Bạn tham khảo thêm trong link đi kèm. Bài thi Nghe B1 phần 1, trường Đại học Ngoại Ngữ - Đại học Quốc Gia Hà Nội có phần thi nghe trắc nghiệm chọn A, B, C còn trường Đại học Đà Nẵng và Đại học Hà Nội là phần thi nghe tranh hình ảnh đúng. Có khi trường Đại học Hà Nội lại chọn thi Nghe trắc nghiệm Đúng – Sai. Các bạn lưu ý đây là đề thi tiếng Anh B1 sau đại học cũ hiện còn áp dụng tại ĐHNN - ĐHQG, ĐH Hà Nội, ĐH Vinh, ĐH Huế, ĐH Đà Nẵng. Một số đơn vị trong miền Nam như Đại học Sư phạm Tp HCM, Trung tâm SEOMEO RETRAC TpHCM, Đại học Cần Thơ đã áp dụng bài thi Vstep tiếng Anh B1, B2, C1 cho mọi đối tượng. Circle the letter next to the word or phrase which best completes each sentence (A, B, C or D). 3. Waiter! There......................forks on this table. 4. I have a test tomorrow, so I......................sit up late tonight to study. 5. An island on which......................is called a deserted island. 6. We wondered who......................to pay for the broken window. 8. John said that no other car could go......................his car. 9. A number of accidents in the last 2 years......................scaused by drunk driving. 10. Perhaps people don’t like________tourists in their country. Look at the text in each question. What does it say? Circle the letter next to the correct explanation (A, B or C). 11. 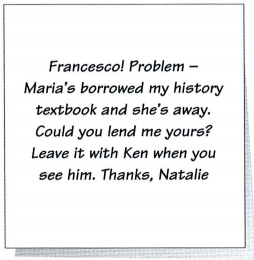 Whose textbook does Natalie want to borrow? A. 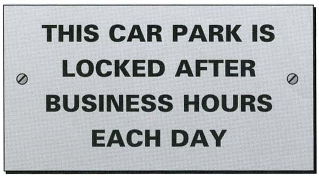 Users must lock the car park after leaving. B. People can park here while they are at work. C. This car park is for employees only. A. The basketball team only wants to see experienced players. B. There aren’t enough team members available on Friday. 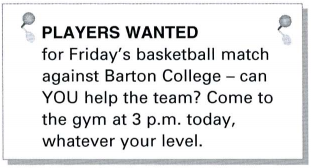 C. The Barton College team will visit the gym later today. A. 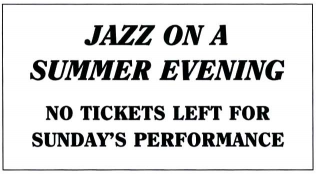 All Sunday evening tickets are already sold. B. You must book tickets for Sunday in advance. C. A ticket is not necessary for Sunday evening. A. Giacomo will be able to see Charlotte early tomorrow morning. 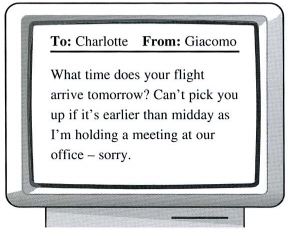 B. Charlotte needs to arrive in time for Giacomo’s meeting tomorrow. C. Giacomo can collect Charlotte from the airport tomorrow afternoon. Read the text and questions below. For each question, circle the letter next to the correct answer (A, B, C or D). A month ago I had no idea that on a Saturday afternoon in November I’d be hanging 30 metres above the ground and enjoying it. Now I looked down at the river far below me, and realised why people love rock-climbing. My friend Matt and I had arrived at the Activity Centre on Friday evening. The accommodation wasn’t wonderful, but we had everything we needed (beds, blankets, food), and we were pleased to be out of the city and in the fresh air. On Saturday morning we met the other ten members of our group. Cameron had come along with two friends, Kevin and Simon, while sisters Carole and Lynn had come with Amanda. We had come from various places and none of us knew the area. We knew we were going to spend the weekend outdoors, but none of us was sure exactly how. Half of us spent the morning caving while the others went rock- climbing and then we changed at lunchtime. Matt and I went to the caves first. Climbing out was harder than going in, but after a good deal of pushing, we were out at last - covered in mud but pleased and excited by what we’d done. 16. What is the writer trying to do in the text? 17. What can the reader learn from the text? 18. How do you think the writer might describe her weekend? 19. What do we learn about the group? A. Some of them had been there before. B. They had already chosen their preferred activities. C. Some of them already knew each other. D. They came from the same city. 20. Which of the following advertisements describes the Activity Centre? Set in beautiful countryside. Accommodation and meals provided. Make up your own timetable – choose from a variety of activities (horse-riding, fishing, hill-walking, sailing, and mountain-biking). B. ACTIVITY CENTRE Set in beautiful countryside. Accommodation provided. Work with a group - we show you a range of outdoor activities that you didn’t realise you could do! Set in beautiful countryside. Enjoy the luxury of our accommodation - each room has its own bathroom. Work with a group, or have individual teaching. Set in beautiful countryside. You can spend the day doing outdoor activities and we will find your accommodation with a local family. Read the text below and fill each of the blanks with ONE suitable word from the box. ………………..it move on the cinema screen. The use (22)…………………..new ideas and advanced computer programs means that cartoons are becoming exciting again for people of (23)…………………..ages. By the (24)…………………..of the 1970s, the cinema world had decided that cartoons were only for children. But soon (25)…………………..one or two directors had some original new ideas. They proved that it was possible to make films in which both adults and children could (26)…………………..the fun. However, not (27)…………………..cartoon film was successful. The Black Cauldron, for example, failed, mainly because it was too (28)…………………..for children and too childish for adults. Directors learnt from this (29)………………….., and the film companies began to make large (30)…………………..of money again. Example: I haven’t enjoyed myself so much for years. 1. My father was given his first boat by his parents. Đáp án: My father’s parents gave my father his first boat. 2. Although his leg was broken, he managed to get out of the car. Đáp án: In spite of his broken leg, he managed to get out of the car. 3. Some people like working outdoors more than working inside. Đáp án: Some people prefer working outdoors to working inside. 4. He has not been to this stadium before. Đáp án: It is the first time he has been to this stadium. 5. John suggested taking a taxi to the hotel. I know you often go to the cinema. Tell me about the last film you saw and whether you enjoyed it. How’s it going? I was very busy this week. But you know that I love films. I saw the film with the name 'Bent it like Beckham’. It’s a very interesting film about football. The main story is about an Indian girl who wants to play football. Her parents don’t let her play. But she’s a very good football player. She's better than a boy who doesn’t know how to play football. Finally, she goes to America for professional league. Santa Barbara. I’m not sure of the team name. Anyway, it's a happy ending for her and for her family. I recommended the film to Mike and he loved it very much. So I do recommend to you the film 'Bend it like Beckham’. If I were you, I’d go the cinema right now. Have a good weekend. See you soon. There are five questions in this part. For each question there are three pictures and a short recording. Choose the correct picture and put a tick (􀀳) in the box below it. You will hear the piece twice. 1. Where will the girls meet? 2. Which chair does the man want? 3. Which picture shows what the girls need? 4. Which picture shows what happened? 5. What is Sarah’s mother doing? You will hear a radio programme in which young people from different parts of the country are interviewed. Fill each of the blanks with ONE suitable word. You will hear the piece twice. Man: Hello and welcome to our series about young people living in different parts of the country. Today you’ll hear Mike Davis, who lives in Hereford, telling you something about his life. Boy: Hello. I’m 13 years old and I go to Stanley School. I’m in Form 3, and I’m really interested in (6) ...................but I find maths and especially English a bit hard. I’m good at (7) ................... and I’ve run for the school team in the 800 metres. My dad sells farm machinery. We live in the country about four miles from school, so I get to school by (8) .................... My uncle has a farm and I spend most of my free time helping out there. He’s got 50 cows and I like to help him with them. I help to do the (9) ................... every Saturday and sometimes I have to clean the cowshed. It’s hard work, but it’s good to see everything looking (10) .................... I painted it white last summer - I’m good at painting. My uncle’s got a (11) ................... and he says I can drive it when I’m 15. I’m looking forward to that. On Mondays I go to the Young Farmers’ Group which I’ve (12) ................... to since I was 10. It’s mostly fun but we also learn things, like how to look after (13) .................. properly. I definitely want to work in the (14) ................... when I leave school. I wouldn’t like to live in a town or sit in an office all day. My father thinks I should work in his business, but I want to be like my uncle and have my own farm one day. My mother says I’ll have to go to agricultural college first, so I’m going to work hard to (15) ...................all my exams. What do you hate the most about children? Ask the candidate to talk about the topic he/she has chosen. Describe a young child you know or know about. And say what you think they might do in the future, and why. Select any of the following questions, as appropriate. Do you think children are spoilt nowadays? Are children becoming more dangerous and violent? What do you think children worry about most?